If you’re like me, when it comes to keeping real plants alive in the house, you’re just not interested. I don’t like to constantly water, or figure out how much or little a plant needs to keep it from what seems like the inevitable death of whatever plant like object has invaded my house. So for me, if I’d like to have something that requires a lot less effort. 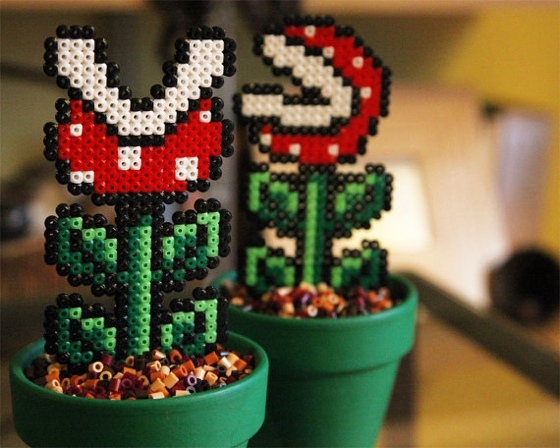 So these Super Mario potted piranha plants are perfect! Not only can they not be killed by having the wrong amount of whatever. They also are super cool and retro too! Do you forget to water your plants? You don’t know why but they seem to always die on you? Here you have the solution! Cute potted Piranha Plants inspired on the Super Mario 8bit evil plants. Made of fused beads.